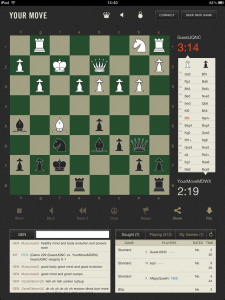 Your Move by red82 Software is a cheap FICS (Free Internet Chess Server) chess client. It doesn’t play chess against you, or analyse games, or store them for later searching. 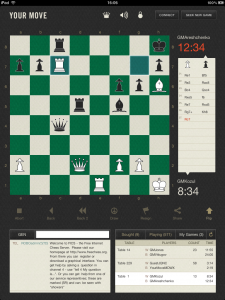 It is a pure chess client. And a nice looking one at that. A good bargain at 69p. You can connect to FICS as a registered user or as a guest. The default guest name it creates for you is prefixed by YourMove, so that’s a handy way of spotting people using this interface on the server. Currently only FICS is supported, which is fine since it is the largest free chess playing server on the planet. The interface feels classical, you get the aged paper look for the panels, antique faded wood surrounds and a classical yet elegant set of chess pieces on an excellent contrast vintage green and pale brown board. 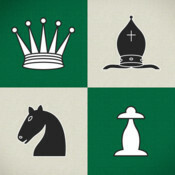 It’s the complement to playing a serious game of chess, and should suit the regular serious player. By default the sound is off, so they need to be turned on to experience the recognisable plink of pieces as they are swooshed across the board. The interface is fixed into portrait mode, so seeing a landscape mode working in a later version would be welcome. The list of games and challenges are – like other chess clients – cached, so finding the right game parameters and accepting challenges requires a little patience and a little luck. Although, you can create your own seeks which seems a little easier way of finding a game. As an out-of-practice non-regular player, I prefer looking at existing challenges rather than creating my own. The game interface is lovely, perfect for the standard blitz game. However, the nature of touchscreens, means that lightning and zero-increment games are a little fraught. So I opt for a little increment per move to iron out these environmental factors. As you are playing the game, it keeps track of moves, as well as the standard stream of FICS chatter. I’ve played a few games using the tap-tap approach: tap a piece and tap the destination. I don’t know if sliding the pieces can be done, but I don’t feel this is an intuitive way of moving the pieces. There’s some nice little touches; when you tap a piece, all the destination squares it can go to are subtly highlighted. Unfortunately, sometimes this feels like you’ve touched the wrong piece. Currently there’s another tiny glitch that when making a move, an adjacent piece can disappear. This is a little worrying in blitz when your strongly centralised knight suddenly disappears. But it does reappear about a second later. Possibly just a repaint issue with the application, and I hope it’s fixed soon – blitz is stressful enough thanks. I’d prefer a send-via-email of the raw PGN, but having the Chess Pastebin option is remarkably useful. It can be shared by merely sending the URL of the pastebin entry, much like every other Pastebin clones out there. Except that it’s chess-aware, so you get to play through the game, flip board, and get the raw PGN. Watching other games in progress is also supported in the interface, and here Your Move shows it’s strength. You can watch several games at once, and swiping to get from one board to another. So you can watch multiple games in progress. Though, you can hear the plinks of pieces being moved it isn’t obvious which board has moved. Another surprising oversight is that if you’ve just joined a game as an observer the game score starts at the current move. There’s no obvious way of seeing all the previous moves in the game score. Navigating the current game is limited to tapping on the moves displayed in the game score. It’s fully-supported features like this I look forward to seeing in future releases. 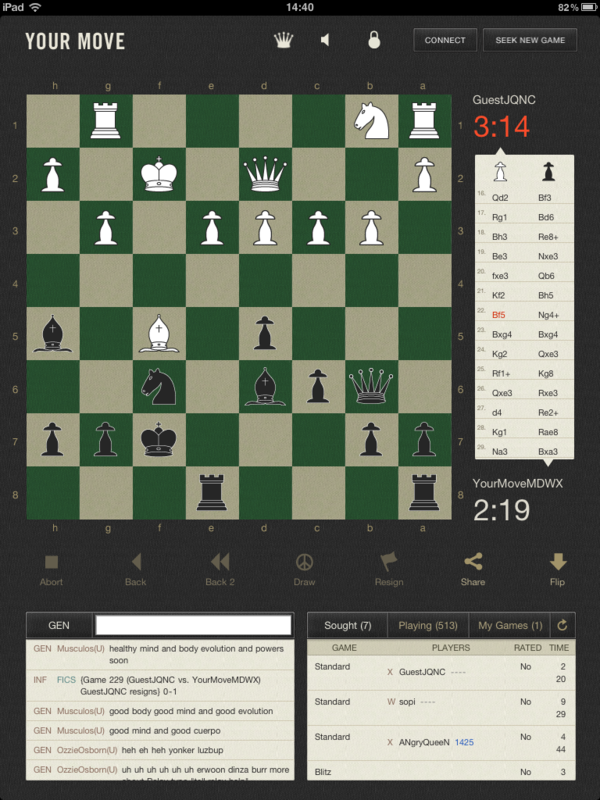 Overall, this is a very decent and usable FICS chess client. 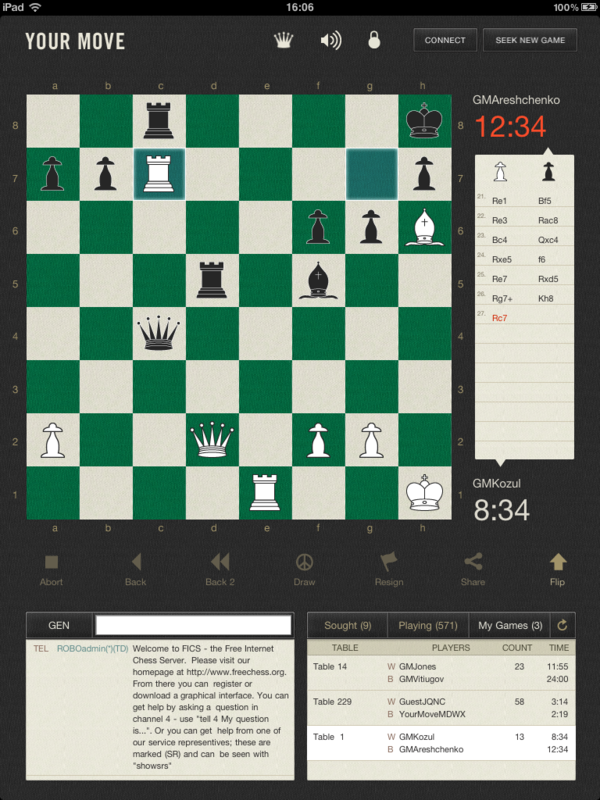 Certainly an improvement over Chess Wise Pro for iPad in usability and general feel. It’s a great first version. Access to the FICS command line for better filtering of games, e.g. finding tournament games being relayed through FICS. Support both portrait and landscape orientations, landscape is more natural to sit back and watch games in progress. With those, I’d have to consider this app a must have chess client for the serious chess player.